As both a parent, and a health-conscious individual, I don’t like using food dyes in my baking. 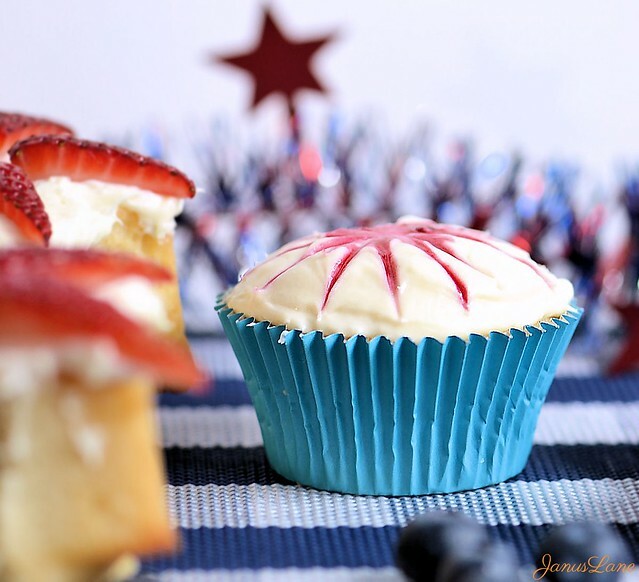 That is why I love these easy firework cupcakes that are made without artificial dyes. It takes hardly any extra time and the ingredients are all natural. The red and purple “dyes” are easily made from raspberries and blueberries. Other berries could be used as well – blackberries, strawberries, cranberries, gooseberries, etc. You just simply simmer the berries on the stove with a tablespoon or two of sugar (I do about 1 tbsp per cup of berries) until you have a syrup-like consistency. It doesn’t get any easier than that now, does it? Well okay, I suppose it does – you could use warmed-up all-natural fruit spread. I’ve had a surplus of berries this year though, so I had to find something to do with them. As the wild raspberries ripen, I’ll no doubt be up to my neck in even more berries very soon. It’ll be a very berry summer. Berrylicious, if you will (but you don’t have to, because you’re probably not as cheesy as I am). As much as I enjoy a challenging recipe, simple ones like this are often the best. There’s no need for perfection, no hours spent on designs or layers. Just an easy, delicious way to pass the time. I like to think of them as “de-stress” recipes. You can run on autopilot and still make something you’ll be proud to share. It’s easy enough that kids can make their own, which would be a fun way to keep them busy while they anxiously await the real fireworks on the 4th of July. 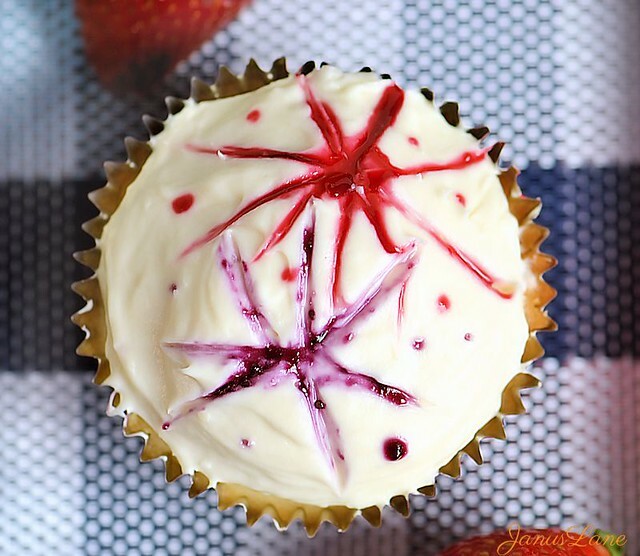 You can find the recipe for the star cupcakes in the picture above here. That also has the link to the blueberry compote recipe, which is what the purple “firework” is made from. 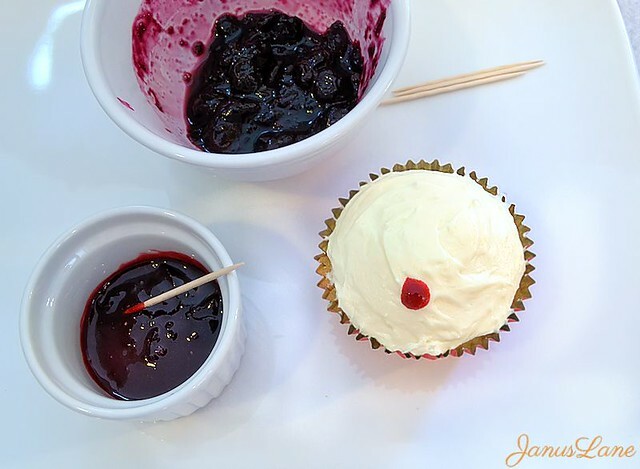 Click here for the cupcake, frosting, and vanilla compote recipe. Oh, and did you see my U.S. Army logo tres leches cake? I made it for Armed Forces Day, but it’s really just an easy to make cake that’s splendid for any day that you want to honor our troops. 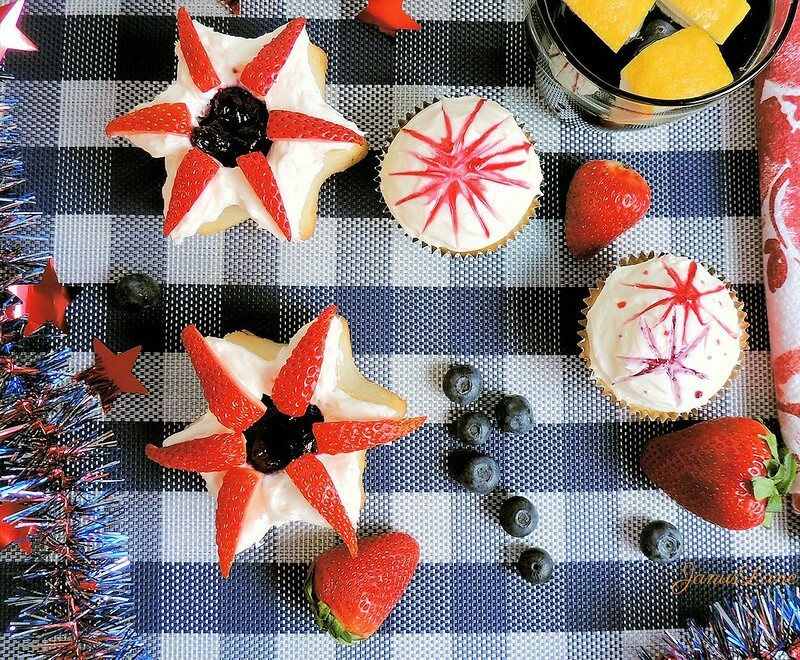 Find more patriotic-themed recipes, crafts, and decorating ideas on Pinterest. Follow Janus Lane’s board Patriotic Recipes & Crafts on Pinterest. 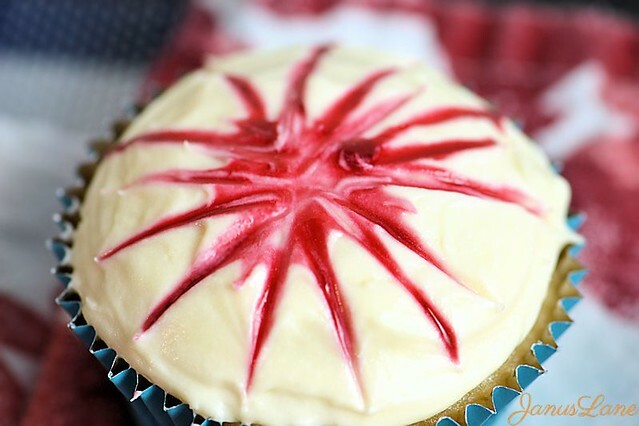 This entry was posted in Recipes and tagged 4th of July, all natural, cupcakes, fireworks, Independence Day by Steph. Bookmark the permalink. I love that these are truly easy enough that I think even I might be able to do it. And I really love that the decorations are natural ingredients. Thanks for sharing! What an easy way to eliminate the food dyes. Thanks for the tip! I absolutely adore these cupcakes! I am making a very conscientious attempt to move my family away from artificial everything. This is perfect treat! Nice work! Love the all natural fireworks!